Pistachios were always around but rarely accessible when I was a kid. They were grown-up snack food that magically appeared in mezze dishes when company arrived. I don't remember seeing or even hearing about pistachios in the homes of non-Armenians. That remained true even after we were married. 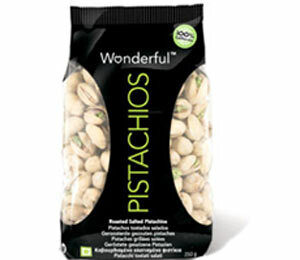 There were no pistachios in the supermarket, but I used to buy them at a Syrian grocery store near my office. I used to get them in a five-pound bag labeled, "Pride of Iran." Then came the hostage crisis of 1979-80 and my favorite pistachios disappeared from the shelves along with everything else from Iran. Then next time I went to the store, the grocer handed me a bag labeled something like, "Pride of Michigan." "It's not the same," I said. "Oh, yes it is," he said, explaining that only the label had changed in deference to American sensitivity. Actually, there was another change. The price had gone up, reflecting the added complexity of international intrigue. I am a patriot, of course, but I'm also a pisatchio lover. So I paid the man. Today, good-old American pistachios are abundant and available everywhere at more or less popular prices. And they're wildly popular as well as praised for their nutritional value. I know this, and yet I was still astounded to read the offical name of this summer's NASCAR race held on September 10th, at Richmond, Virginia: The Wonderful Pistachios 400. We're talking about a sport that roared out of the soul of the American South, where boiled peanuts and fried pork rinds ruled the snack roost not long ago. I've read stories of early racers who were pelted by chicken bones as fans tossed them from the stands. Now I'm picturing a backstretch slick with a fine dusting of crushed pistachio shells. This was one race I couldn't miss -- and you know what I was snacking on. Does the NASCAR sponsor import its nuts from Iran? Oh, never mind. They're too good to worry about where they came from!